0.02 l.m. of textual records. - 7.86 MB of textual records. The file contains primary source material on the history of the Sherbrooke and District University Women's Club. 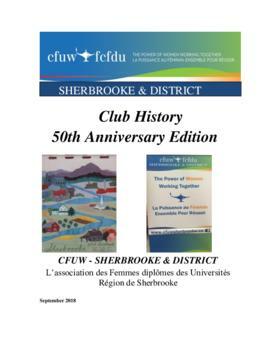 It consists of a history of the Sherbrooke and District University Women's Club; a certificate; 25th, 40th, and 50th anniversary club histories; brochures; and pamphlets.